U.S. President George Bush and Congolese President Joseph Kabila met at the White House Friday to talk about economic development and efforts to re-establish security in eastern Congo. VOA White House Correspondent Scott Stearns has the story. When President Kabila was last at the White House four years ago, President Bush pressed him to hold free and fair elections in the Democratic Republic of Congo. Mr. Kabila took power following the assassination of his father, Laurent Kabila, who led a rebellion that toppled long-time dictator Mobutu Sese Seko. Joseph Kabila won the country's first multi-party elections last year, and President Bush says America will help consolidate the gains of greater political freedoms. "Mr. President, you said that you wanted there to be free and fair elections. And you delivered," said Mr. Bush. "And I appreciate that and congratulate you on being a man of your word and we look forward to continue to work with you, sir, to bring peace and stability to the neighborhood." With that vote behind him, President Kabila says his priorities have shifted from elections to stability, peace, and development. "We need continued support from the United States in order to achieve these two remaining goals which are peace and stability throughout the whole country and embark on a very, very long journey of development and really try to combat poverty, which is the biggest issue not only in the Congo, but in the region and on the African continent," he said. President Bush offered to work with the Congolese leader to encourage private investment in his country to create jobs and establish the security that comes with economic development. Mr. Bush says the men also discussed President Kabila's strategy for re-establishing government control over parts of the eastern provinces of North Kivu and Ituri. Various rebel forces and militia are active in a part of Congo that has been unstable since the 1994 genocide in neighboring Rwanda sent millions of refugees into what was then Zaire. 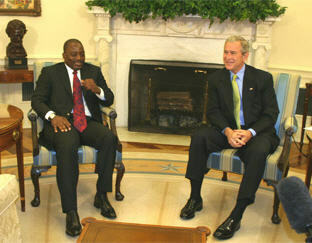 President Bush says he and the Congolese leader also discussed efforts to combat Malaria.